The games industry now rivals Hollywood, with millions being invested in triple-A titles that have budgets similar to a summer blockbuster movie. The media circus is constantly warning how big games such as Assassins Creed, Far Cry, Call of Duty and Hitman are corrupting our nation’s youth whilst blurring the line between fact and fiction. Daily Mail-type newspapers will be quick to tell you that our kids are being manipulated into thinking killing and stealing is acceptable, but of course we all know that this is sensationalist nonsense. What you don’t read in the media is how the school playgrounds are no longer talking about the latest Call of Duty maps or kill streaks. Young gamers in droves are turning their back on expensive, violent games that show a complete lack of imagination, and their familiarity with the rehashed sequels every year breeds nothing but contempt for them. Studio executives have a complete lack of understanding of their audience, mainly because a middle-aged man in a suit has long lost something that cannot be recaptured, something which young gamers have in abundance. What I am talking about here is imagination. This one word encapsulates what video-games were built on, and have returned to, in a somewhat poetic circle. Last week, Minecraft became the first game to dethrone the Call of Duty franchise that has dominated the top position of the Xbox Live activity chart for several years now. A fantastic David vs. Goliath story, where an indie developer can destabilise the establishment. Last week the Golden Joystick awards saw Minecraft win the XBLA best downloadable game, and a new category was born in the form of ‘YouTube Gamer Award’. Sponsored by YouTube, this saw the triumph of Yogscast, arguably one of the reasons for the success of Minecraft with their semi-improvised comedy drama known as “Shadow of Israphel”. Minecraft is a world where you build to survive the dangers of the night, and where the only limit is your imagination. Yet for some reason, most people over 30 cannot grasp this simple concept, which is something that is nothing short of fascinating. On many occasions, I have found myself in a room full of adults that simply cannot comprehend why their kids are captivated by this game and its retro visuals that look 20 years past their sell-by-date. It doesn’t take long until someone says something like: “Why would you play something like this, on a powerful games console when there are so many games with amazing graphics to play?” The kids give a knowing look to each other and sigh at these adults that do not understand their world. Who are the stupid ones here? Young gamers who are working together using their collective imagination to build something unique? Or the mature gamers, who play the same Call of Duty maps every single night so they can prestige for the 10th time, like a deranged lab rat looking for a reward in the form of a shiny new symbol next to their gamertag? 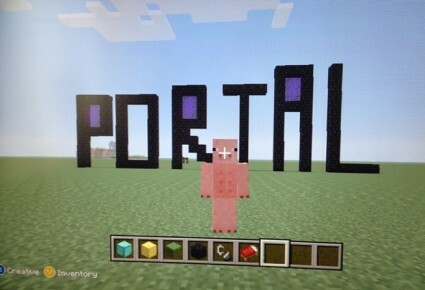 We are now living in a world where buzzwords such as ‘innovation’ and ‘engagement’ are paramount to the long-term success of anything, and this is what the makers of Minecraft have tapped into. Change is the only thing in life that is constant, and there is something quite beautiful about our children shunning what has been repeated and repackaged to them. In contrast, they are thinking for themselves, and the fact that imagination and creating something unique is an alien concept to the powers that be is quite a sad state of affairs. Studios have become lazy, and mistakenly thought gamers were lazy too. They thought if they packaged stunning graphics and a few spectacular explosions, they would have a winning formula on their hands. Yet big budget games are rapidly becoming a shallow and empty experience. Quick Time Events mean the gamer just sits there and has to quickly press a button that pops up during a cut-scene, before being bombarded with adverts, more cut-scenes and nubile women characters; because we are all dumb shits, right? Hell no. Gamers of all ages are much more sophisticated than that, and the winds of change in the air is proof of just that. Gamers voted for games such as Minecraft and Skyrim to win Golden Joystick awards last week rather than Call of Duty. There must be a more than a few worried people out there, as the rehashed sequel business model just isn’t going to cut it anymore. Mainstream media very often prefers to demonise the youth of today, as well as our beloved pastime. The fact that young gamers have reminded us that the concentration on graphics alone is the reason games have been going downhill lately is refreshing, inspirational and heart-warming, in my opinion. Maybe we can all learn a lesson from this and concentrate on the games themselves rather than the graphics, and realise the power of our imagination that many of us have left dormant after many years of neglect. ← Call Of Duty: Black Ops II – The Hype Has Returned, But At What Cost?